Open to teenager between the ages of 17 to 20 years, who are residents of Malaysia. Deadline: 15th January 2016, Friday 6p.m. Participants may submit their artwork to the following address during regular business hour (from 9a.m. - 6p.m). 8.1. Artwork must be in A3 size drawing paper. 8.2. Use of recycled or reclaimed materials is encouraged. 8.3. Artwork must be related to the theme “Save the World”. 8.4. Participants must submitted their photocopy of NRIC / related documents together with the artwork by post or email. 8.5. All artwork submitted will become the property of IGP Design & Project Management. 8.6. All artwork submitted will be posted to www.igp.my & our facebook to vote for the winners. 8.7. Failure to comply will result in disqualification. 9.1. 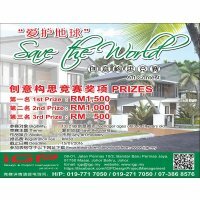 Registration fee is RM30.00 per entry and it is Non-Refundable. 9.2. Registration fee is payable by cash or make your cheque payable to IGP Design & Project Management and send to the address stated as above. Call: 019-771 7050 / 019-271 7050 / 07-386 8576 for more details.